There’s no one doubt that education is very important for every child’s maximal growth and development. Since not all children are born with good learning skills; it becomes parents’ task to build this skill from children’s younger age. Don’t ever be bored to always encourage your child to love learning and schooling! Is it hard to make your child loves school? You may try some ways like providing your child with good supply of interesting books and fun school items such as coolest kids bags, backpacks, lunch boxes, drink bottles and stationery. When choosing a right school bag for your child, make sure that its size suits with your child’s age and needs. I’ve ever seen a little boy carried a too-big backpack on his back; he seemed uncomfortable to walk! There are other things that parents should consider about kids school stuff. As most children love to wear unique and personalized items; it would be fun for them if you personalize your child’s stuff by adding name labels, bag tags, keyrings or embroidery. Any school stuff will look special when there’s a child’s name attached to the school item. It’s definitely a simple approach that will make your child proud to have and wear. To specially give identity and personal touch to your child’s school bag, attaching personalised bag tags for kids won’t be wrong. 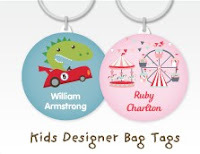 Personalised bag tags are cute name tags with fun images and design; your child will surely love it. You should choose high quality bag tags that created from excellent materials as those will keep looking good and lasting long! Personalizing children’ school stuff is already proved to be able to give various benefits for parents. Children tend to more care for their name-labeled belongings; it will positively cause the reducing of losing personal items which means saving money. When your child forgets to leave his school stuff somewhere, the name tags on it can be useful tools for you to track and find it again. So, don’t ignore the importance of labeling your kid’s stuff!